Your tires and brakes are what keep you in control while you’re driving. However, without properly functioning brakes, you could find yourself quickly rolling out of control. That’s why it’s important to keep an eye out for wear and tear. 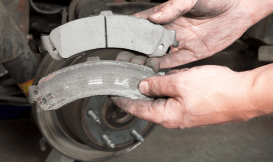 Any time you take your wheels off for maintenance, such as a tire rotation, it’s a good idea to inspect your brake pads, rotors, and calipers for damage. The first part of the system is the master cylinder reservoir, which is filled with hydraulic brake fluid. The master cylinder itself is attached to the brake pedal. When you depress the pedal, it creates pressure in the brake lines that go to the calipers. The calipers have pistons inside of them that press your brake pads against your brake rotors, thus allowing you to slow and stop your vehicle. The most frequently replaced maintenance items related to brakes are the pads and rotors, followed by the calipers, brake lines, and the master cylinder. 1. First check the master cylinder. Look for leakage around the pedal box and the master cylinder itself. If your brakes are leaking fluid, or won’t “pump up” when you attempt to bleed them, you may need a new master cylinder, brake lines, or calipers. 2. Next, check the pads. Remove your wheels and have a look at the wear indicators molded into the surface of the pads. If you can’t see the indicators, it’s time to install new brake pads before they start rubbing against the rotors. 3. Finally, check the rotors. You’ll need to determine their minimum thickness before you inspect them. This number should be listed in your service manual. Use a caliper to check the thickness of your brake rotor. 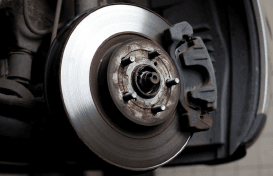 If it fails to meet the minimum thickness, you should replace your brake rotors as well as your brake pads. 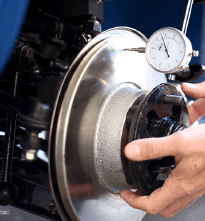 Additionally, if you see heavy gouging, grooves, or scoring on the surface of your brake rotors, it’s a sign your pads are most likely down to their metal backing. If this is the case, you may need new rotors as well as brake pads. Ratchets, sockets, and extensions. 3/8” and 1/2” drive, fractional and/or metric, depending on your vehicle. Most older American cars and trucks use fractional fasteners, whereas imports tend to use metric. Breaker bar, 1/2” drive. In a pinch, you may elect to slide your jack handle over your ratchets to increase the amount of leverage and force you can apply on the fastener. Combination wrenches. Choose metric sizes for most foreign vehicles and fractional sizes for most domestic vehicles. C-clamp. Use this to push the pistons back into the caliper before you fit new brake pads. Torx, reverse Torx, and/or hex sockets. Many German cars use Torx, reverse Torx, and hex head fasteners, as do some American cars. Torque Wrench. Use this to ensure your fasteners are neither over nor under tightened. Pry Bar Use this to work stuck parts free. Depending on your vehicle, you may also need a seal driver and/or other tools to complete your brake job. Brake Pads & Rotors. If your rotors aren’t scored or gouged, and they meet the minimum thickness specification, then you can leave the rotors and change just the brake pads. Rotors. Replace your rotors if they are scored, gouged, grooved, or fail to meet the minimum thickness specification. Brake Fluid Choose the appropriate fluid by reading the specification from the top of the master cylinder reservoir or in the service manual. It contains essential information, like rotor and fluid specifications, for doing the job right the first time. 2. Jack Your Car Up. Use your floor jack to lift the car up. Support it with jack stands and remove the wheel and tire. Check to see how much friction is on the rotor by turning it by hand. A small amount of drag is normal. Remove the caliper so you can inspect the condition of the rotor. To do this, loosen the bleeder screw, located on the back of the caliper. 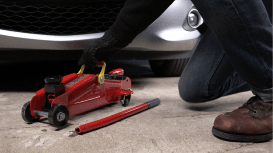 Then, disconnect the flex hose, which is connected from the caliper to the car, by loosening the fitting that attaches it to the car. At this point, place a metal pan beneath the caliper to catch any remaining brake fluid. Then, remove the caliper retaining bolts, rock the unit back, and pull it away from the rotor. Remove the hub retaining nut in the middle of the rotor. Some rotors will slide off without any unbolting after you have removed the caliper. The rotor should come off easily. If a rotor is badly worn with heavy scoring, gouging, or grooves on its surface, it’s time to replace it. If not, you will need to use your micrometer or a caliper to measure its thickness. If it fails to meet the spec listed in the manual or on the rotor, it must be replaced. While you can refer to the service manual, your rotor most likely has the minimum thickness measurement stamped on its edge. If your rotor is dirty or rusty, use a wire brush to clean it and expose the measurement. Once it is clean, use your micrometer and determine whether the minimum amount of thickness remains. If it exceeds the minimum amount of thickness, wear on the face of the rotor can be machined by a service technician. If not, it must be replaced. 5. Check the Wheel Bearings. If your car has a sealed roller bearing and it has become worn (normally around 100,000 miles), the entire wheel hub assembly must be replaced. If it has a tapered roller bearing, as most cars do, you can remove the roller bearing from the hub assembly and inspect it. Look for evidence of pitting or scoring. If it has these conditions, the wheel bearings should be replaced. It’s important that the bearing is greased prior to installation. Before handling the grease, take some hand cleaner and rub it onto your hands, especially concentrating on your fingernails, then wipe off the excess. Next, take a large portion of grease into the palm of one hand and the bearing in the other. Turn the bearing to its wider end and press it into the grease, until the grease appears through the holes in the bearing. Take some time to make sure the grease is worked through the entire bearing. Then, work some grease into the bearing race on the hub that holds the bearing. Finally, insert the bearing. Next, you must apply the grease seal. Many people make the mistake of pounding the seal into place with a hammer. This typically destroys the seal, forcing you to buy another one. However, you can save time and money by using a seal driver, which you can purchase at your local Pep Boys. This tool fits over top of the seal, allowing you to hammer at the top of the tool and push the seal into place without causing damage. The money you save on seals should cover the cost of a seal driver. If your brakes are squealing, the pads may also need to be replaced. Sometimes the reason brakes squeal is because the brake pad wear indicator tab is being exposed by wear. However, other times brakes squeal for absolutely no reason at all, even on new vehicles. That’s why it’s important to inspect the pads closely beforehand. Taking the old pads off the caliper is easy. They usually click in and out of place. When putting new pads on, it is advisable to apply an anti-squeal gel to the back of the pads. This is applied to the side of the pad that comes in contact with the caliper or steel backing, not the friction material that contacts the rotors. If there doesn’t seem to be enough room for the pads and rotor to fit inside the caliper, use your c-clamp to push the pistons back into the caliper. Be sure to loosen the bleed screw before attempting to push the pistons back into the caliper. If you are applying the gel, allow about 30 minutes for the material to dry on the pads before replacing them. Then, simply click the pads into place. 7. Put the Assembly Back Together. Now that you have checked all the components of your brakes and replaced or fixed any parts as needed, it is time to put them back on the car. First, take the rotors and wash them with soap and water to remove any grease that may be left from your hands. Then, put them on the spindle and attach them into place using the hub retaining nut, if present. On some vehicles, you just slide the rotors over the lug nuts. It’s extremely important that you make sure you torque all fasteners to the specifications outlined in your service manual. Over- or under-tightening can cause major damage to your car and/or jeopardize your safety while driving. Slide the caliper back into place and torque the bolts to the specifications in your service manual. Then, reattach the flex hose to the brake line. 8. Bleed the Brake Fluid. You can remove old brake fluid from the master cylinder by using a turkey baster and sucking the old fluid out and putting it into a pan. Then you can add new fluid. Go to the caliper and attach a rubber hose to the back of the bleeder screw and put the hose into a pan for it to drain. Have a partner sit in the car and pump the brakes while you open the nut to drain out the old fluid and bubbles in the line. After several times through, tighten the bleeder screw again. Make sure your brakes “pump up” and function correctly before attempting to drive. If you’ve done everything correctly, the pedal should not go all the way to the floor, or anywhere near it. 9. Replace the tire and wheel assembly, put the hubcap back on, and you are finished!